1. In a medium non-stick skillet, heat oil over medium heat. Once hot, stir in onions and sprinkle with salt. Saute until lightly brown and turning translucent, 5-7 minutes. 2. Stir in garlic and chili flakes and saute one minute more. 3. Stir in bell pepper and mushrooms, sprinkle with salt and saute until the veggies become soft, around 5 minutes. 4. Stir in the crumbled tofu, Bragg’s/soy sauce, curry powder, cumin and tumeric and continue to heat until everything is warm, around 5 minutes. If there is a lot of water at the bottom, keep cooking until that evaporates (or leave it in, which is what I did). 5. Place spinach overtop and cover. Allow to wilt slightly, approximately 1-2 minutes. 6. Remove form heat and sprinkle with nutritional yeast. Serves 1 (or 2 with a side). I’ve actually never had a tofu scramble! But the curry in this is calling to me. So that’s going to change….probably sometime this week! Yum! I’ve been craving scrambled tofu (have some raw dehydrated eggplant bacon strips to have on the side), but have been trying to avoid tofu since it’s not whole foodish-enough…..but now that YOU have posted this (and eaten it! ), it’s back in the rotation! 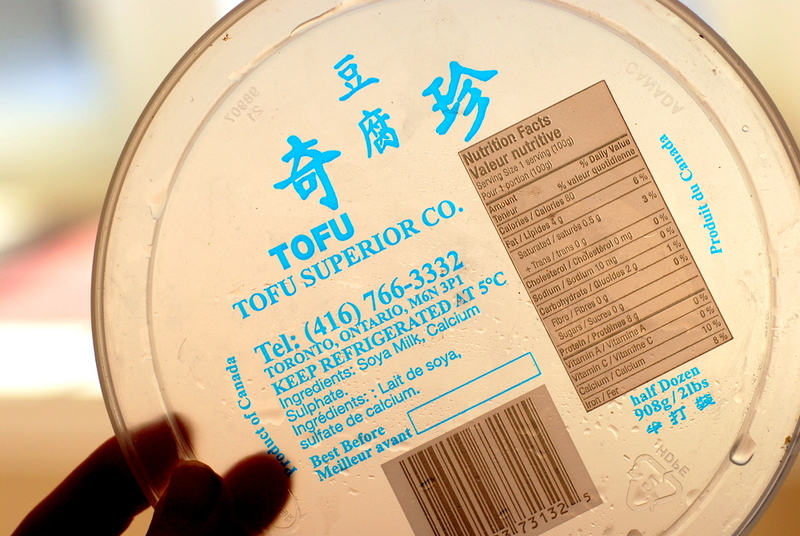 was going to the Korean market today, which makes homemade tofu, so you know what’s on my shopping list. Have never done a scramble with soft—as you noted, all my recipes have called for extra-firm or at least firm (you rebel you!). I agree so much with the softer tofu thing – I discovered that by accident about a year ago and it is definitely way more eggy. 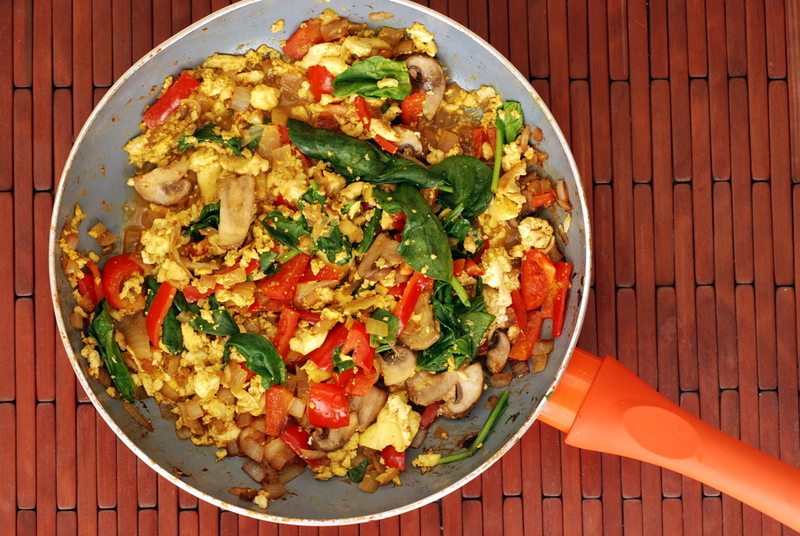 I haven’t used curry spices in a scramble for a while, but it looks like heaven. 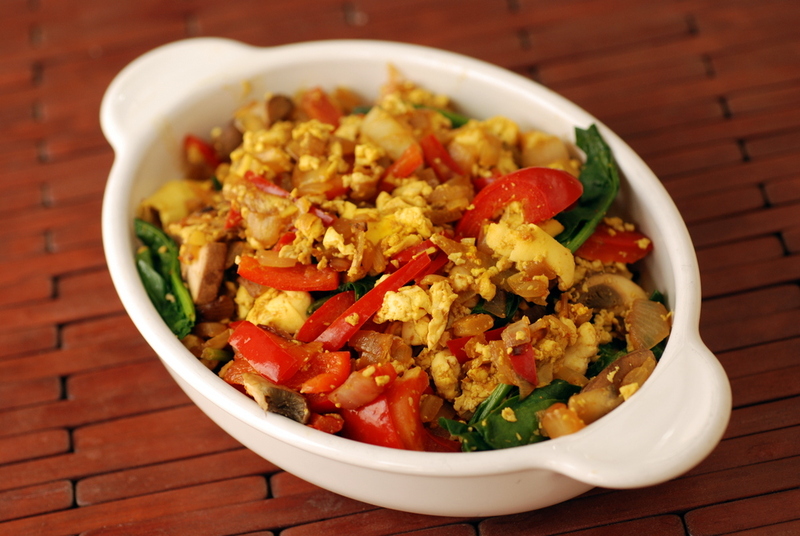 I’ve never tried scrambles with soft tofu but, gosh darn it, I’m trying it now! It sounds more egg-like for some reason. OH MY GOD HOW COULD HE PASS UP NEIL GAIMAN?! It was actually a very challenging decision for me. I felt that the likelihood of encountering Neil Gaiman talk in the future would be greater than an Al Gore one, though. Gaiman isn’t my favourite author, though, so it wasn’t the utmost priority for me to see him. I enjoy Neil Stephensen’s work much more, though. And the Al Gore talk was legitimately entertaining… So I have no regrets. i think i might like tofu finlally in this masaledaar form.. hubbs is the weekend breakfast besan chilla omelette champion too. you can expect crazy additions on them chillas. Conference choices can be difficult, but at least he was in the position of it being difficult because there were too many good ones, rather than the reverse! It looks like you’re putting your time in the kitchen alone to good use – this dish is great! Had this yesterday for lunch. Only sub was red cabbage for the bell pepper since Andy used the last pepper for raw corn bread. The soft tofu worked like a charm. Terrific! Usually with scrambled tofu, I smother it with salsa, but this was flavorful as is—required no doctoring—the ultimate compliment! 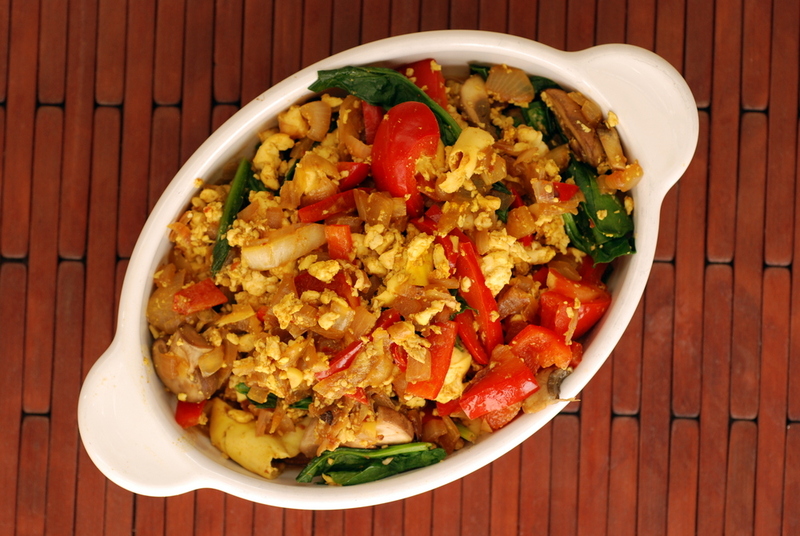 I’ve never really had tofu scramble as a dish on its own before, which is a bit surprising considering scrambled eggs used to be the only way I could enjoy eating eggs! This one sounds super flavourful though, and I like the extra colour from the red pepper and spinach. The soft tofu sounds like a good tip – if I’m going to try eating soft tofu, it would have to be in a dish like this! I really would love to eat this and will be trying this recipe out as I am trying to cut back on my meat intake and I happen to love tofu. All the spices and flavourings must make this a delicious dish for lunch or dinner. I’ve just turned pescetarian and this is such a great recipe that I wanna try soon! Breakfast is my favorite and I love spicy too, so this is a perfect combo!